Recorded at Advision Studios, London, England from November 1972 to June 1973. Geoff Young – engineer. The original Yes guitarist’s solo debut, made at some point while he was in Flash, features quite a line-up of guest artists. 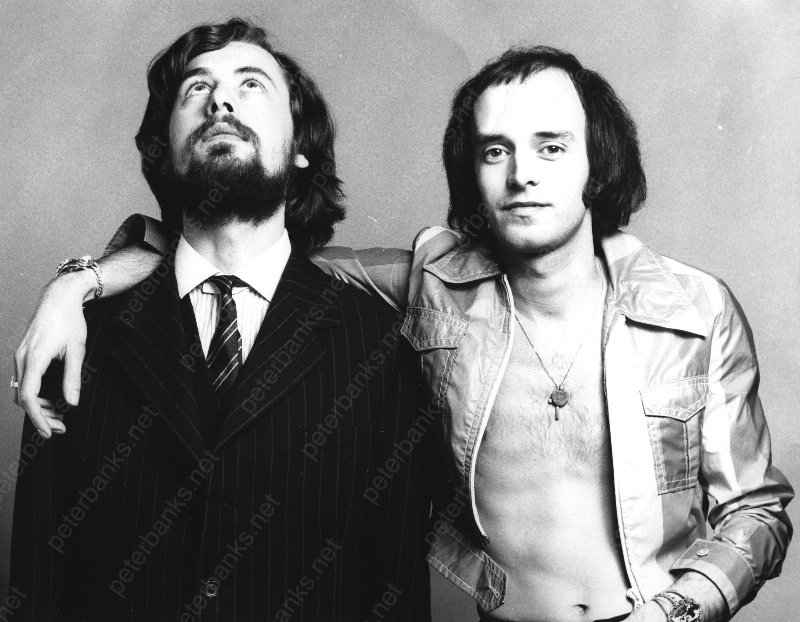 Predominantly, these are Jan Akkerman of Focus, who is Banks’ main collaborator, Phil Collins, and Flash bandmates Ray Bennett and Mike Hough. Briefer cameos are provided from Steve Hackett and a John Wetton who was just dipping his toes into King Crimson at the time. The album opens with a beautiful electric guitar duet, Banks’ classic volume pedal tones and Akkerman ringing out with sad, gothic fifths characteristic of his work in Focus. The other duet, Akkerman’s “Beyond the Loneliest Sea,” is even more impressive, with more weeping willow support from Banks and Akkerman laying down some luscious classical guitar. This album certainly won’t be to everyone’s taste (solo guitar album — hello!). However, it’s a shame that outside of Yes fandom — and sometimes even within it — Banks hasn’t really gotten his full recognition as an outstanding guitarist in his own right. Listening to this, I am reminded of that seemingly long-gone era of guitarists, who didn’t need to rely at all on a cadre of effect boxes or studio trickery, but had a command of the instrument that can only be had by playing and playing and playing. This album is more of a collaboration between Banks and Jan Akkerman than a true solo album. Akkerman has co-writing credits on most of the tracks, and even full credit for the acoustic guitar ballad “Beyond the Loneliest Sea”. The interaction of the two guitarists is what really makes this album stand out for me – they’re both good on their own, and they’re great together. The first half of the disc (the original “side one” of the vinyl) consists of a continuous suite of songs, with composed sections and repeated themes alternating with solos and jams. Side two is mostly made up of the lengthy jam entitled “Stop That!”. Both sides are good, but overall I think I prefer the more composed side one. The entire album is instrumental, so those who must have lyrics may be disappointed. A word of warning – don’t be fooled by the impressive list of musicians on the back of the jewel case (Phil Collins, Steve Hackett, John Wetton, etc). What the packaging fails to mention is that most of those guys are only on a track or two. Still, this is a very enjoyable album, and definitely increased my respect for Peter Banks (who, before hearing this disc, I just thought of as “the guy who was kicked out of Yes so they could hire Steve Howe”). I’ll grab pretty much any solo or spin-off LP from my favorite bands, and I’ve learned not to get my hopes too high. I have to admit, though, that the impressive guests featured on this ex-Yes/Flash guitarist’s first and only solo album for 20 years got them up a notch higher than I’d had for any Steve Howe release. The lack of vocal credits was another promising aspect, assuring a 43 minute instrumental onslaught. Most of the project was actually co-piloted by Jan Akkerman of Focus fame, and his input is noticeable at many points throughout the album. The framework is built around the two guitarists, side two containing a couple of loose jams which are quite enjoyable when taken as just that. Interspersed portions of the album are made up of noodly and jazzy guitar duets, sometimes with Akkerman, sometimes with Peter doing multiple tracks, split between the two stereo channels. The true splendor of this album, however, is brought to fore on side one in the trilogy of “Knights”, “Battles”, & “Knights- Reprise”, the latter of which features Steve Hackett on guitar, Phil Collins on drums and John Wetton on bass. The structure of these songs, like the material on side two, is somewhat flimsy by some prog standards, but launches into awesome guitar riffs, cycles through repeated themes and capitalizes well on the instrumental talents of the guests. Thanks to that, this LP didn’t leave the turntable (except to occasionally flip it) for a week or two. A pleasant surprise.